The result of a groundbreaking collaborative effort between living-legend amp designer Reinhold Bogner and renowned amp-modeling upstarts Line 6, Spider Valve MkII 112 40-watt combo amplifier offers the best of both worlds: brawny, boutique-style tube amp tone and the latest, most advanced Line 6 amp modeling with complete flexibility and deep editing. Get in front of sparkling clean tones inspired by a Hiwatt Custom 100, syrupy smooth drive tones inspired by a mix of a ’65 Marshall JTM-45, a ’58 Fender Bassman and a ’63 Fender Vibroverb, British pop/rock tones inspired by a Vox AC-30 Top Boost, high-gain onslaughts inspired by a Mesa/Boogie Dual Rectifier and a Diezel Herbert, Class A crunch inspired by a Divided by 13 9/15, classic Class A breakup inspired by an Orange AD-30, and more! 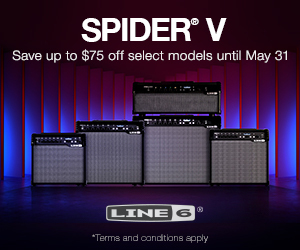 Store every gig’s tones with the Line 6 Spider Valve’s 128 user-programmable presets. Need to shape your tone? Tweak the Line 6 Spider Valve amplifier’s Bass, Mid and Treble knobs just like you would on the original vintage amps. When you choose an amp model, the EQ section behaves just like the EQ section of the modeled amplifier. Line 6 Spider Valve 112 MkII guitar amp gives you a complete, organic and fully authentic representation of its 16 vintage and modern amplifiers. Start smart and dive deep with the unprecedented control of Line 6 Smart FX. It features 20 brilliant effects, delivering unprecedented color, adjustability and routing options. You can tweak up to 6 parameters of any effect—including the intelligent Smart Harmony and Pitch Glide, and easy-to-use 14-second Quick Loop—and route it pre or post for an extraordinary collection of tone-shaping tools. Plus, you get every guitarist’s required palette of colors including beautiful Delays, tangy Mods, lush Reverbs and more. Up to 4 effects can be used simultaneously. Line 6 Spider Valve MkII 112 is poised to become the workhorse amp for all kinds of pro players. 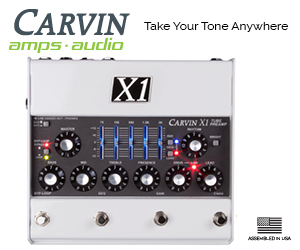 Its seamless integration into MIDI rigs allows for quick changes to all front-panel controls, easy synching of your time-based effects (to themselves and to your drummer’s click-track) as well as other time- and energy-saving features. 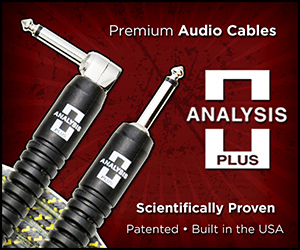 Plus, two output modes deliver easy and effective solutions for direct-recording and gigging. Performance Mode lets you send a signal, which provides tube and modeling interaction, via the XLR out to the front-of-house engineer. Studio Mode bypasses the tubes to send the platinum-album Line 6 modeling only. Many so-called tube amps employ low-voltage “marketing” tubes to add authenticity to their “tube amp” claim. The Line 6 Spider Valve MkII 112 guitar amp boasts bona fide Bogner-designed preamp and power amp sections that run at lethal voltages (about 300 volts and 450 volts, respectively) to produce exceptional depth, tonal coloration and richness. The signal from the Line 6 front-end flows into the pair of 12AX7 preamp tubes to produce creamy, cascading distortions and enriched tube harmonics. The perfectly matched pair of 6L6 power tubes then drives the Celestion Vintage 30 speaker to provide unprecedented sonic impact. After being poured from the 12-inch Celestion Vintage 30 speaker, your tone soaks up the spanky thump of the tuned three-quarter closed-back cabinet. The result is a guitar speaker with tight low-end punch for a truly exceptional feel. Line 6 FBV foot controllers deliver out-of-the-box volume/wah, pitch control, preset control and more. FBV Shortboard MkII pairs perfectly with Line 6 Spider Valve 112 to offer complete, handsfree control of the on-board Line 6 Spider Valve MkII effects including Quick Loop, Smart Harmony and more. The guitar amplifier’s bright and backlit oversized LCD makes it easy to see preset names and the chromatic tuner.